The intended release date is Mar 31th. Thanks to all beta testers! Manually entering points on a background map works in both geotrace and geoshape. Thank you very much that this feature has found input in ODK. However, you will always be forced back to the current GPS position. Is it possible to decouple the manual positioning from the current GPS position and thus navigate freely in the background map? If you turn off gps on the device, then it works. However, my forms always contain the types geopoint and geotrace (manual entry of the lines). Turning GPS off and on again is therefore not very comfortable. @Dominik, thanks for the feedback! I also see that the map "bounces" back to the GPS location every time a new GPS reading is made even when in manual entry mode. I agree that should not be the case. @zestyping, @yanokwa, what do you think? Reference to this url bit.ly/odk18277 is not available. Good catch, @Alexander_Torrado! I've fixed it. GeoTrace is being removed? What will be the available options. Did you check on the KML file exports. 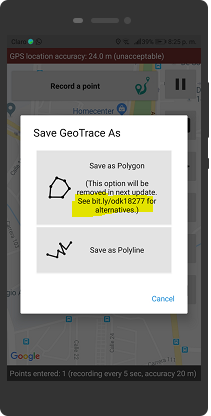 Why not include the direct message "If you use GeoTrace to collect polygons, please update your form to use GeoShape instead"? Because link text is not hyperlink, you have to write it manually to see it. 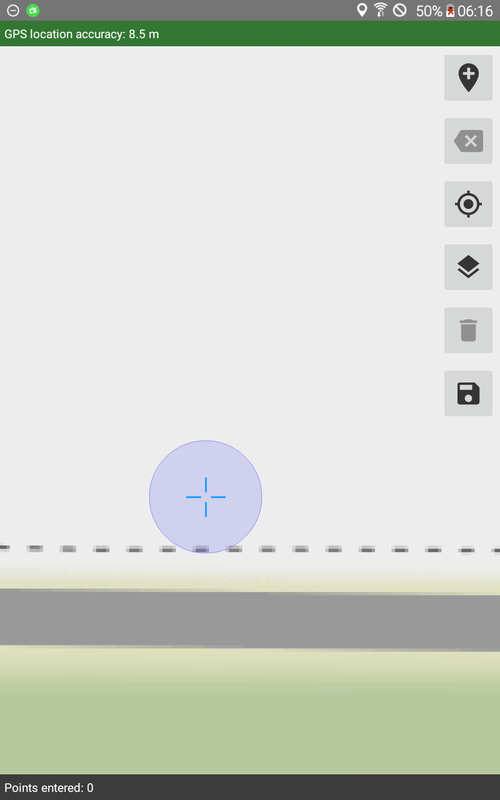 GeoShape to collect a polygon formed by the user manually setting points. In other words, this release makes sure geotrace and geoshape questions can collect points in the three possible ways. The next release will make sure geotrace always collects a trace and geoshape always collects a shape. @Alexander_Torrado That is a very good point. The improvements/future changes sound great too! manual positioning of a line over the type geotrace works. Notice that on the right, there is a red circle that indicates a set point just like when points are set by tapping. Set points used to be indicated by large markers but those made it hard to see the precise location of the point. If that doesn't explain the problem you're facing, please provide more details. On my device (Huawei mate 10 pro with Android 9) the problem is there. How you can see on the video. Could it be a prob with android version or/and my model? Thank you so much for that video, @Dominik! You have indeed identified a bug. 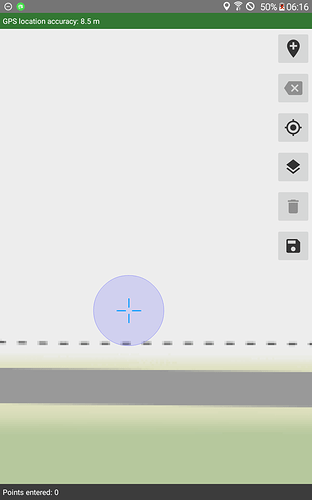 When using Google Maps, tapping in the accuracy circle recenters the map on your current location instead of placing a point. I've filed an issue at https://github.com/opendatakit/collect/issues/2991 which should be fixed shortly. In the mean time, you can long press to enter points within the accuracy circle. @Dominik Thanks so much for reporting the issue. We've shipped an update to the Play Store with the fix. You should see it in a few hours! I have tested the manual creation of one polyline. It works. 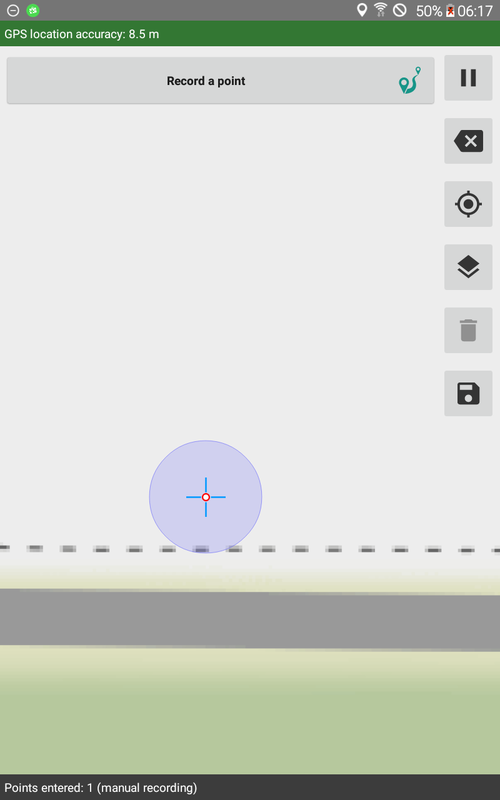 However, the point I manually set close to my own GPS position seems to be caught by the gps position marker. But that is not bad in my opinion. You are right @Dominik the fix we implemented is not perfect but there is now way to do that better at this moment.